Akash means having a cavity with freedom to move. The qualities of ether element are clear, light, subtle, and immeasurable. Ether element is related with various actions like expansion, vibration, non-resistance. Sensory organ related to ether element is ear as it is hollow and transmits the sound waves. Air is the great element that shows a sense of movement. Vayu or air initiates & directs motion or movement. Air element keeps the body in constant motion. Air element is mobile, dry, light, cold and subtle in nature. Its main action is to do any kind of movement. All various forms of transformation including digestion of food are carried out by fire element. Perception of light is carries out by this tanmatra. Fire element is hot, sharp, light, dry and subtle. Various functions carried out by this element are penetration, digestion of food, and transformation of thoughts, intelligence and perception of light. Water shows important quality of binding.This binding nature helps in forming different structures in the body as it binds the 2 cells together. The water element exhibits qualities like cool, liquid, dull soft, and sliminess. Its main actions are cohesiveness and adhesiveness. It is solid, dense, gross and very hard. It is related to all solid and hard structures that show shape – e.g. bones, muscles, teeth and nails. 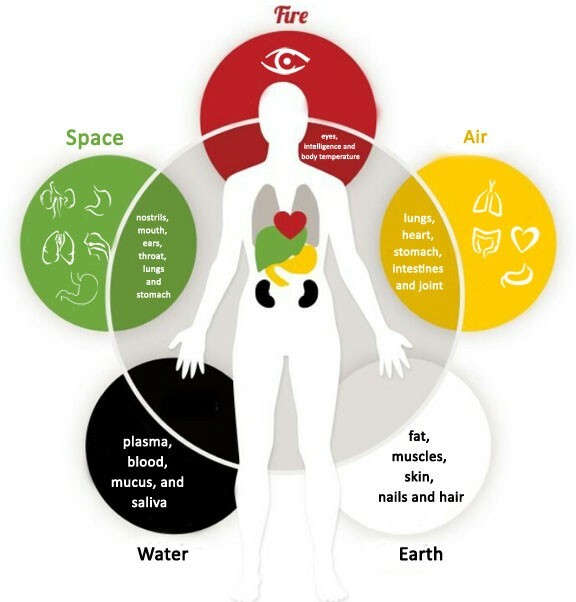 The Earth element is responsible for giving structure, shape and strength to the body. Qualities of earth element are heavy, dull, dense, hard and gross.